Here is proof of the old saying that one man’s trash is another man’s treasure. This port crock was decluttered from our home some time back. I actually can’t find evidence of it on my blog so I can only assume that I filed the photo in the wrong file and it has never featured as a daily declutter item. Which only makes this story even more of a funny coincidence. I am also therefore not sure whether we donated it to the thrift store or sold it on eBay. The photo was taken in February of this year. However the story goes like this. My husband walked into the office of one of his colleagues yesterday and noticed an object on his desk. He asked how it got to be there. 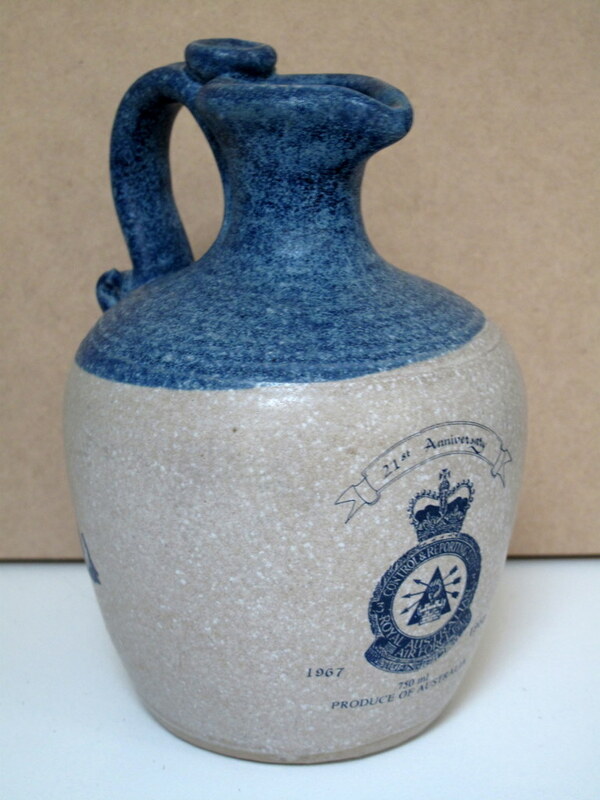 The colleague informed him that is was given to him by another colleague to keep as a precious relic of Unit history. On closer inspection my husband confirmed that it was the very same port crock that we had decluttered same time ago. There was a unique paint imperfection which made it stand out from any other similar crock. It commemorates the 21st Anniversary of 3CRU (No.3 Control and Reporting Unit,) a surveillance unit of the Royal Australian Airforce. If we had known it was “so precious” we would have donated it to the unit ourselves. My husband however was quite amused by it all. Steve was very amused, it was the first thing he told me when he arrived home from work. That crock is about 24 years old now. So the unit must be heading for it’s 50th birthday in about five years. That’s just SO amazing! I always find it interesting when I donate items to Goodwill and later shop there to find someone else buying the item I donated. It’s fun seeing new life given to items you’re no longer able or willing to provide a home for. I am lucky because I get to see that all the time volunteering at the thrift store. Sometimes I barely get items processed, when I go in on a Wednesday, before someone is back at the counter purchasing them. What a hoot. Interesting to see something you “thrifted/ebayed” show up like that. I was happy with the end of your story. I was afraid that it was going to be one of those sob stories where now you are never gain to part with anything because it could be valuable. My mother-in-law’s house is one of those treasure troves that you just can never be to sure about what things are worth. Most of it comes from garage sales but that doesn’t mean it isn’t worth something. Nevertheless there are so many individual items that I have no intension of valuing them all if she happens to die before I do. that’s just one for the too hard basket. Yes, there are times when you can get something at a yard sale that is really worth something. I know of a friend who found a $10,000 painting at a garage sale for $1. She tried to go back and find the place after getting the news but couldn’t. As for your MIL. When she passes have any family bid on the stuff they want (doesn’t have to be big money) and then have an Estate sale company come in and give you a price for the rest. That usually works better than trying to get rid of it yourself. My great aunt had her executer do that. People came in and gave silent bids on what they wanted. There was a bit of a bidding war on a couple of items but the rest seemed to go easily. About 1/4 of her items were taken by family. The rest was sold in an estate sale and the money divided among the stated heirs. Sure made for less fuss. that does sound like a good plan. Love the story Colleen, and it had a happy ending! Regarding the movement of things from thrift shops, I live in a small community and have donated clothing only later to see one of my own friends wearing items. I was wrapt, so were they and the op shop also made a few dollars…so it is all good! that is the perfect example of a win win situation in fact it is win win win. You freed up some space in your home, your friend got a new-to-her outfit and the thrift store made a few dollars. I think we could call that a three way symbiotic relationship. Wow Deb J, that is super news. Perhaps you had better sit down for a while. Somewhere close of course so you can encourage her to keep giving. You did post that picture! This reminds me of that British show “secret dealers”. It was shown here a couple of months back. Three antique dealers go into a person’s house and have a look, anything they like they put a secret bid in. Then at the end the owner decides if they are willing to take the price. One episode had an elderly woman (in her 70’s probably) who had heaps of stuff……….the dealers offered her over 14,000 pounds for various items. Plus they were good prices and of market value. She parted with about 3 or 4 items – maybe 200 pounds worth. I must say l kind of shook my head, l mean she isn’t going to take the stuff with her when she goes. But then l guess the items were just too sentimental for her to part with. The house was too cluttered for my liking. it does make you wonder why these people volunteer to go on a show like that if they haven’t really got any intension of getting rid of their stuff. I’d have taken the 14,000 pound rubbing my hands with glee. Crazy folks! Colleen, l know – l just did the conversion and that amount is equivalent to over $22,100 Australian. wow! Wow alright, That would pay for my trip to the USA next year with some left over. that is amusing. I hope you put his name on the bottom of it this time. This has jogged my memory of another husband decluttering story but I think I will save it for next Saturday’s Simple Saturday. how very nice of you to nominate me for this award. Although I am honoured I just know that, at the moment, I don’t have the time to fulfil the obligations that go along with the award. I am so busy these days with posting five days a week, volunteering, running a home etc that I haven’t had a lot of time to check out new blogs. Finding 15 to nominate would take up more time than I have right now. Thank you though I do appreciate that you considered me for this award. There is a book sort with a similar theme as a starting point called The Blue Sweater, where a young woman’s sweater was donated, and she was eventually in Africa and saw someone wearing it. There was some mark on the label, I think, that confirmed it was the exact same sweater. It’s not such a small world after all is it. My father went to his home town for a funeral about five years ago. They had car troubles on the way and took the car to the dealer when they arrived in town to get the problem sorted. My father noticed a man looking at him and the man said to my father “I’ve seen you before somewhere”. My father said “I grew up here so maybe you know me from my younger days”. “No” the man said “I saw you once in Pioneer Square in Seattle near the ice sculptures.” My father nearly fell over, it had been about 5 years previous that they had been visiting me in Seattle and we didn’t meet these people that day they just happened to notice us because we had Aussie accents. The man must have had a great memory.